Upon my return from my first field visit after joining Digital Green, I was frequently confronted by curious colleagues and friends asking “How was it? What did you see? What did you learn?” These simple questions left me thinking. The truth is, what I saw and felt is not easily explained with a “Good or Great”. I spent almost a week visiting villages and interviewing health workers and beneficiaries in various districts of Jharkhand to understand Digital Green’s approach and impact to capture how this is being used to achieve the goals and objectives of the USAID supported project Samvad. 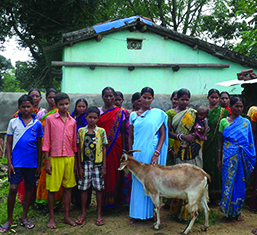 In Jharkhand, we work in partnership with Jharkhand State Livelihood Promotion Society (JSLPS) who have a cadre of community resource persons called Cluster Convergence Coordinators (CCCs). They are trained in various government initiatives. 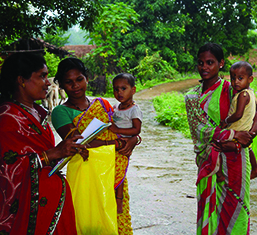 Digital Green leverages these resource persons to disseminate best practices on health and nutrition among Self-help Groups and Anganwadi Centres. 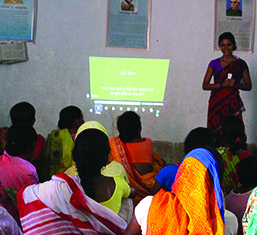 They use Digital Green’s videos to share information with beneficiaries and other health workers. This was my first visit to Jharkhand and I was completely mesmerized by the beauty around me. We had to drive through the dense Saranda forest (frequently in the news for internal conflict) to reach our destination, Manoharpur block in West Singhbhum district. 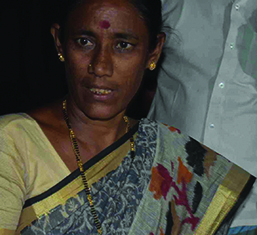 It is here that I met Janki Mahto, a fiesty CCC. Conversation between us flowed easily as she described her experience of joining JSLPS and attending Digital Green’s trainings. The discussion was an eye-opener for me, living in Delhi, we easily assume that women in rural areas are unaware and not empowered enough. We imagine ourselves as their ‘knights in shining armours’ who would magically appear to improve their lives but little did I know a training on video dissemination is itself an opportunity to invest in their empowerment. Next day, I attended a dissemination training on immediate breastfeeding in Chiria town of West Singhbhum, attended by the local tribal women. I asked how many of them fed their baby breast milk within the first hour of the birth. I was surprised that most of the women raised their hand. Upon further probing, they related this practice to how the calf is fed its mother’s milk immediately after birth. This simple parallel that they drew with nature around them displayed such wealth of knowledge that I felt ashamed to have doubted their apparent simplicity. The next day I travelled to Patratu, a town in Ramgarh district of Jharkhand where I attended a video dissemination training and met the beneficiaries. When I asked them about why they adopted specific practices, the beneficiaries said that there are certain practices that they understand and are easy to adopt in their daily life. And if they personally benefit from that practice, they tell their friends and neighbours and aspire to better services. This first visit to the areas where Digital Green is working in left me hopeful and optimistic about the future of these women living in the difficult to reach areas. It might be difficult to hear their voices, but the stories they tell are poignant and worth listening to. It was difficult to convince the farmers to adopt any new agriculture practice due to my own limited knowledge on the subject. 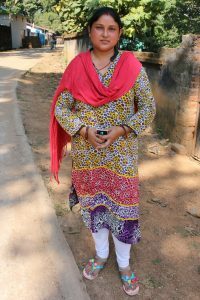 Rinki Devi has been one of the best mediators in her block - it wasn't easy given the stiff resistance she faced from her family.